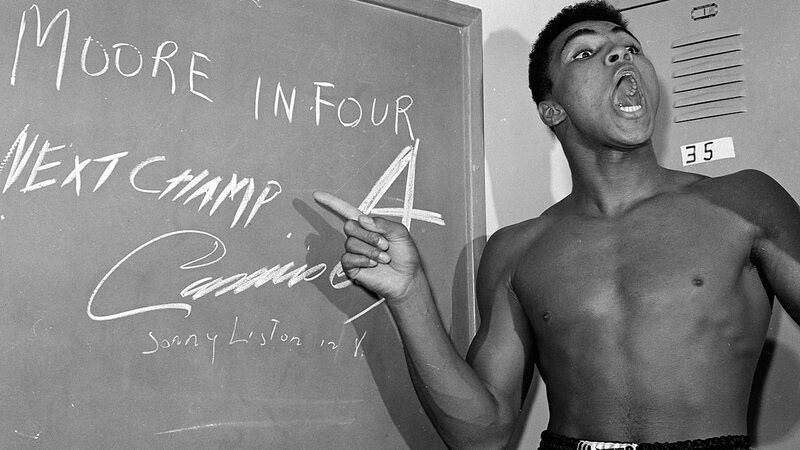 Muhammad Ali taunted opponents with razor-sharp rhymes, comical one-liners and the type of boxing braggadocio that both endeared him to and angered the masses. Ali was a loudmouth threat to the establishment. He could make heavyweight rivals Joe Frazier, Sonny Liston and George Foreman feel like unwitting participants at their own roast. He was king of the world and a clown prince, who fought for both championships and his rights as a conscientious objector. His mouth roared, never bored, with wit as sharp as a sword, who went full bore into each fight with a silver tongue and heavyweight gold. No one could say it better than Ali. So why try? "Float like a butterfly, sting like a bee. Rumble, young man, rumble." - 1964, before his fight with Sonny Liston. "I'm king of the world! I'm pretty! I'm a bad man! I shook up the world! I shook up the world! I shook up the world!" - Feb. 25, 1964, Ali after defeating Sonny Liston. "It's hard to be humble when you're as great as I am." - Undated. "I ain't got no quarrel with them Vietcong." - Feb. 17, 1966, Ali's famous explanation of why he refused to serve in the United States Army. "You serious? I got to stay here and lead my people to the right man - Elijah Muhammad." - when asked why he doesn't flee the country in an interview by Robert Lipsyte of The New York Times on April 26, 1967, two days before refusing induction into military service. "I've done my celebrating already. I said a prayer to Allah." - June 28, 1971, on being told his conviction for draft evasion was overturned by the U.S. Supreme Court. "They did what they thought was right, and I did what I thought was right." - on government's long effort to send him to prison. "I told you all, all of my critics, that I was the greatest of all time. ... Never make me the underdog until I'm about 50 years old." - Oct. 1, 1974, after knocking out George Foreman to become heavyweight champion for the second time, in Kinshasa, Zaire. "I saw your wife. You're not as dumb as you look." - To President Ferdinand Marcos of the Philippines a few days before he beat Joe Frazier in the Thrilla in Manila on Oct. 1, 1975. "My gloves are going to jail! They ain't done nothin' - yet." - on being told the commission member in charge of the gloves would keep them in a prison until his fight against Joe Bugner on July 1, 1975, at Kuala Lumpur, Malaysia. "My name is known in Serbia, Pakistan, Morocco. These are countries that don't follow the Kentucky Derby." - New York Times interview, April 1977. "All I can do is fight for truth and justice. I can't save anybody. He's a science fiction character, and I'm a real character." at a news conference Jan. 31, to announce a comic book in which Ali beats Superman. "People say I talk so slow today. That's no surprise. I calculated I've taken 29,000 punches. But I earned $57 million and I saved half of it. So I took a few hard knocks. Do you know how many black men are killed every year by guns and knives without a penny to their names? I may talk slow, but my mind is OK." - Jan. 20, 1984, while in Seattle for a benefit for Sugar Ray Seales, legally blind because of detached retinas suffered while boxing. "What I suffered physically was worth what I've accomplished in life. A man who is not courageous enough to take risks will never accomplish anything in life." - at a news conference Oct. 28, 1984, at Houston.